It can be very dangerous working near a main road, especially when it's dusk or dark. That's why our High Visibility Rucksack With Logo from Calendar Lady Promotions will come in very handy and might even save your life. Our High Visibility Rucksack With Logo is made from reflective material so that when a car or lorries headlights shine upon it, you will be seen loud and proud. Also we can have our High Visibility Rucksack With Logo printed up with your business details and company logo to ensure that your personal business details are always advertised in these very competitive times. So help to promote your business details and company logo upon our High Visibility Rucksack With Logo and keep yourself seen. 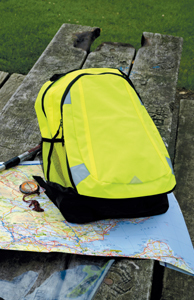 To find out more about our High Visibility Rucksack With Logo click here and fill in the contact form and we'll get straight back to you. Other promotional and personalised items besides our High Visibility Rucksack With Logo click here.